I went, nervously, at lunchtime yesterday. 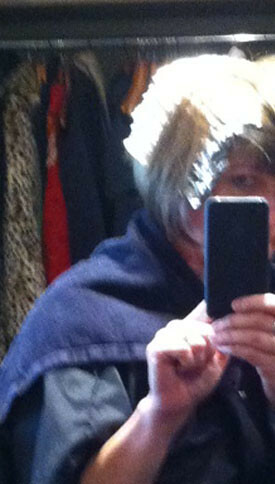 My hair guy (my hair GENIUS) was waiting with his tray of smelly stuff and tin foil sheets. There were three or four terrible blonds in the salon and I was nervous. They were as yellow as a post-it pad, a legal pad, a taxi! 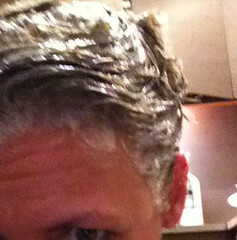 I begged him not to make me blond. I showed him a picture on my phone. I don't know if I can get you that light, he said softly, and off we went. He put me under a dryer, hothothot. A timer went off. We went back to a sink (no mirrors!) and he rinsed and peeked and made thoughtful faces while I was bursting with curiosity. There's a little spot of yellow-ish orange over here, but I think we can lift it. He messed with it for a while and then had an assistant mix something else which he applied in sections and sat me down in a station with a mirror. No glasses. Tough to read and wait. Stared at my head for a while, wondering. The last thing in the world I wanted was blond. Slight panic. Three sets of timed waiting and finally back to the sink for a long gentle, cool, rinse and a heavy conditioning. Back to his station for the blow dry. It didn't look like much wet, but as soon as he had a section dry I was gasping. It has a dozen shades of grey. White in some spots, very pale blond in others. He matched my mostly white roots and there are a few areas where my actual hair color is showing. And, do I love it? I'm up incredibly early, so I get to post first! your hair looks great! Congratulations. I ask the colorist for extra foils so I can wrap the earpieces on my glasses. Not super comfortable, but I can read while I wait. Looks fabulous, not a hint of yellow anywhere! ps - What are those shoes on your bulletin board? I love that shade! It is beautiful…. You and Suse could be twins! It's lovely. And i agree, your head and Suse's head could be twins. Very awesome twins. Love your photo documentation of this. Made me come out of lurking to comment, it's so cool. Your hair guy is a GENIUS. It looks lovely and very natural. Now you'll keep being surprised when you pass your reflection. I love it, too! I am also going grey. But mine is the salt-and-pepper variety. Just so I can sing "Push It" whenever I look in a mirror. So chic I can't even tell you. I admire your style of photography and I've been imagining your appearance all wrong all this time. I LOVE the hair.....both style and color. I could have easily put money on it (and I should've)! Its' even BETTER than I expected!!! GASP! Omg, I love it!! And how cute are you, peeking from behind that folder?! Your gray is going to grow in soooo nicely. YAY! Lovely! Do you still match your wardrobe? Do you have to change your makeup? I hope you report on all the RL comments you are going to get! GORGEOUS! Really. It looks terrific. I love your hair guy. Well done! Oh my goodness. It's wonderful. Perfect! I love it. Cute cute cute! You look great! I was COMPELLED to comment on how fantastic your hair turned out! The only thing better will be when it is all your own lovely natural grey. Congratulations and hurray for you! So brave and I love it! Oh look at us all delurking !! So lovely to get a glimpse of you and I am ridiculously excited by how it turned out! 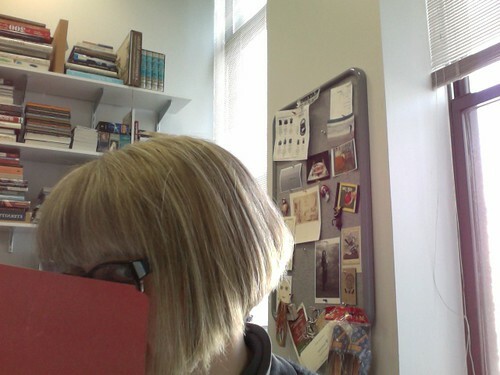 That is my bob and those are my glasses - now all that I have to aspire to is the fabulous grey. I am working on it. Gorgeous! You and Suse are all matchy-matchy. Your hair guy did very well! Free at last, how I envy you! Now, where does one find their own hair GENIUS, I wonder? You SHOULD love it! It's so fun! but on your lunch... how long is your lunch? truly I am in awe of this. I thought of Suse, too! It works, it really, really works! Yay you! I have been off at the inaugural Aust blogging conference so have only just seen this. Breathtakingly beautiful. Hair Whisperer. Go You! super cute, bb. love it!